There is no doubt that bank fixed deposits (FDs) are considered safe in that you will most likely get your money back. But did you know that bank FDs can negatively affect your savings over the long term? The average inflation rate in India for 2012-2014 was 9.76%. Most FDs only give you about 8.5% interest before tax and around 7% after tax. This means, you are effectively losing money every year you invest your money in a FD. Compared with equity mutual funds, long-term returns are taxed at 10% for holding period more than 1 year, on gains more than Rs 1 lakh. FD interest is taxable at your current tax slab. The higher your income, the lower your FD return will be. That raises a question- "if bank fixed deposits are not a good way of allocating all my savings, how else should I invest my money?" Invest in mutual funds! 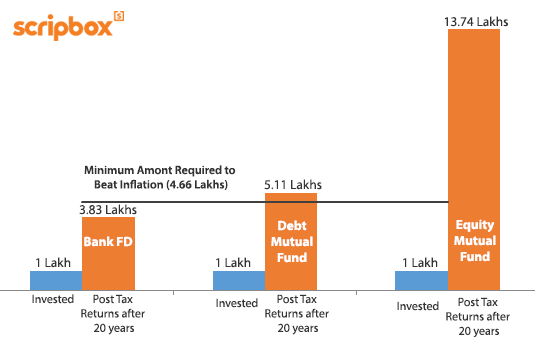 See the graph below for FD vs mutual fund comparison. Return assumptions - FD @ 7%, Debt fund @ 8.5%, and equity fund @ 14%. Inflation assumed to be 8%. As you can see, investing in Bank FDs will result in less money than you need to keep up with inflation. Debt mutual funds just about manages to beat inflation and equity mutual funds beat inflation with almost 3 times the inflation adjusted amount. Mutual funds provide professional management of money, are tightly regulated and have proven their performance over time. Mutual funds are also very tax efficient and a little bit of planning can reduce tax on your mutual fund returns to zero (in case of equity mutual funds) or almost zero (in case of debt mutual funds). Should I invest in equity or debt mutual fund? Equity mutual funds are recommended for long term investing (more than 5 years) and debt funds for shorter durations. But even investing in mutual funds can be daunting. When you decide to start, you'll be swamped with jargon like index funds, diversified, large cap, NAV, etc. It’s can be really confusing and most people stop there. That’s exactly why we created Scripbox. It’s built for people like you who want an absolutely simple, yet efficient, way to invest in mutual funds without having to worry about how their money is doing. To get inflation-beating returns and automated money management at zero cost, get started with Scripbox investment solution. Based on the concerns some of our customers raised, here are some additional clarification. Yes. Mutual funds are subject to market risks. However, over the long term, equity mutual funds have shown to provide phenomenal returns. Take a look at how equities have performed over the past several years backed by actual available data. 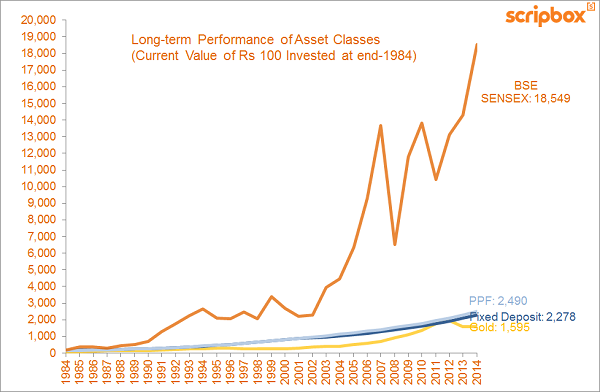 Even though equity is volatile, it has performed better than all other asset classes including FD, Gold, and PPF. 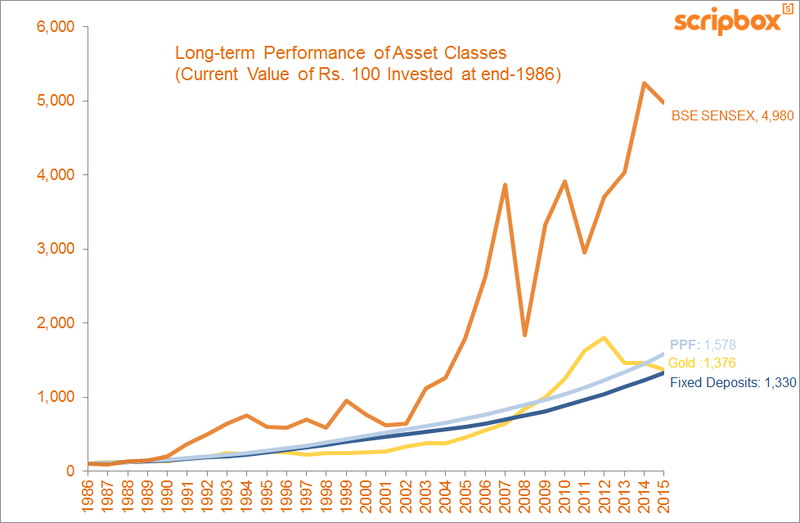 No other asset class can grow your wealth as much as equities. Since direct equity investing is riskier and time-consuming, we recommend investing in equity mutual funds which are professionally managed by a fund manager. If you want a less volatile option, you should choose debt mutual funds. They are less volatile and more tax efficient than FDs. While returns will be lower compared to equity, they still provide better returns than FD and also manages to beat inflation. If you want your investments to give you regular income, still debt funds are better than bank FDs due to the long term tax efficiency. You can keep withdrawing from your debt fund corpus or set up automatic withdrawals instead of relying on the monthly interest payout by the banks.